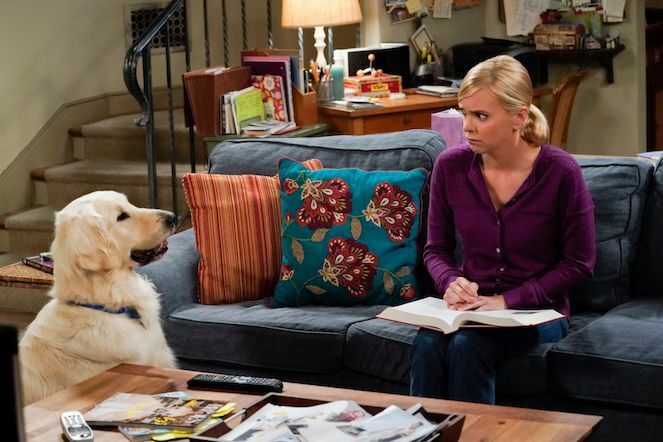 Anna Faris is headed back to school on the small screen in the season 6 premiere of Mom. In two photos released of the first episode of the upcoming season of the CBS comedy, Faris' character Christy looks shocked during her first day at law school. In the official synopsis for the episode, called "Pre-Washed Lettuce and a Mime," Faris' character Christy has "second thoughts about law school after a tough first day." Christy wears a purple shirt and sits at a row of desks looking frightened by whatever her professor is saying. In another photo, she looks equally startled while attempting to study, which apparently is not going as well as she hoped. Elsewhere in the episode, according to the official synopsis, Allison Janney's Bonnie "is plagued by an upsetting dream." The Emmy-award winning show — which averages 11 million viewers — is still going strong headed into its sixth season; CBS ordered another season of it back in April, with CBS Entertainment president Kelly Kahl calling it a "lynchpin comedy for us over the last several years." Mom stars Faris and Janney as well as Jaime Pressly, Mimi Kennedy, Beth Hall and William Fichtner. The renewal of the CBS comedy means that Chuck Lorre fans will have uninterrupted Thursday nights once more, as The Big Bang Theory and Young Sheldon both return this fall for new seasons. While Young Sheldon likely has a long future ahead of it, as it's ranked as CBS' second-highest comedy in just its sophomore season, the long-running Big Bang Theory is finally coming to an end after its upcoming season. Teased as "the biggest season in Bang's history," season 12 was decided as the show's final season after star Jim Parsons shared that he wanted to explore other projects outside of the show. Parsons reportedly told the show's cast and crew of his decision and Lorre followed up with the news that the upcoming season would be the series' last. Season 6 of Mom premieres Thursday, Sept. 27 at 9 pm. ET on CBS.